Most cases of the intranasal FBs do not require otolaryngology consultation and can be handled by the experienced primary care physician with proper equipment. 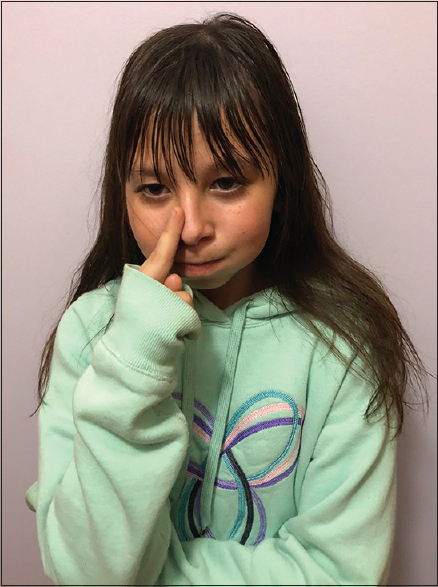 FBs that are in the posterior nasal cavity, poorly visualized, chronic, impacted with associated severe mucosal inflammation, or those where removal attempts have failed, warrant further referral. Of note, there are two FBs that may cause severe damage and necessitate urgent attention and skilled removal: button batteries and disc magnets., The search for dangerous metallic FBs may be hastened by obtaining X-rays. Intranasal FBs are most commonly found along the floor of the nasal passage under the inferior turbinate or anterior to the middle turbinate. Finding FBs on the right side is more common, possibly due to increased prevalence of right-handedness,,, but it is important to search both nasal canals, as well as both ear canals, for other FBs. Figure 1: Materials that may be required for removal of nasal foreign body, numbered as listed above. Not pictured: otoscope, blanket, pocket magnet pickup, oxygen tubing, male–male tube adapter, cotton pad, cardiac pacemaker magnets. Suction: metal suction catheter or other device. Oxygen tubing and male–male tube adaptor. Gaining the trust and cooperation of the patient and caregiver are imperative. If unable to do this, the patient may need to be restrained or sedated. Visualization of the FB can often be achieved by simply using a headlight or otoscope. If available, a flexible endoscope can be used to find elusive FBs that are thin, transparent, or superiorly located. If an FB cannot be visualized, in a cooperative patient, irrigating the nasal cavity with saline and suctioning the fluid and debris may enhance visualization. Ask the patient to close the opposite nostril with a finger and then blow through their nose [Figure 2]. Parents of children too young to do this may blow air into their child's mouth while occluding the unaffected nostril. Alternatively, positive pressure can be achieved by closing the patient's mouth and inserting a male–male tube adapter hooked up to 10–15 L/min of oxygen into the unaffected nostril [Figure 3]. Figure 2: The patient should close the opposite nostril and blow through their nose. Figure 3: Male–male adapter placed on the opening at the end of the oxygen tubing with oxygen flow pictured at 10 L/min. The open end is placed in the unobstructed nostril to create positive pressure for the expulsion of the foreign body. The positive pressure technique is best for smooth FBs that are easily visualized and occlude all or a large portion of the nasal canal. Small, nonocclusive objects in the anterior nose and objects that remain after attempting positive pressure should be removed with instruments. There are a variety of instruments that may be used for FB removal; however, there are certain steps that are essential for success, regardless of the chosen instrument. Except in the case of button batteries, the following is helpful. 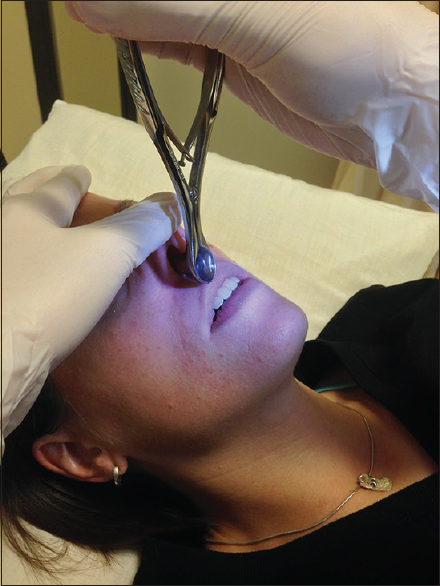 Five minutes before removal is attempted, a topical anesthetic and vasoconstrictor should be applied to the affected nostril,,, as decreasing the swelling around the FB increases the chances of successful removal. This can be achieved by instilling a few drops of 1-2% lidocaine and either 0.5% phenylephrine or 0.05% oxymetazoline. It may be beneficial to apply the solution mixture through a soaked cotton pad gently inserted into the affected nostril. The need for restraint and procedural sedation should be assessed. Cooperative patients may tolerate the procedure while sitting. For young children and noncooperative patients, a sheet wrap should be used to hold the patient in a supine position on the bed while an assistant holds the patient's head. If the patient continues to be uncooperative, procedural sedation may be required. The nasal canal should be illuminated and examined using either an otoscope or a nasal speculum with a headlight or lamp. The thumb of the nondominant hand may be used to pull the tip of the nose upward while the dominant hand manipulates the instrument [Figure 4]. Figure 4: The nondominant hand pulls the tip of the nose upward while the nasal speculum is manipulated with the dominant hand and a headlamp is used for illumination. The choice of instrumentation should be based on the characteristics of the FB. Nonocclusive, compressible objects, or ones with rough surfaces may be easily grasped and removed using forceps (alligator, Lucae, or Gruenwald). However, forceps should never be used for round objects, as this risks pushing them further into the nasal canal. Smooth, round objects that cannot be grasped easily (e.g., beads, pebbles, and marbles) require more care. Removal may be attempted using a blunt right-angle hook to pull the object out of the nasal canal. If this is unsuccessful, a balloon catheter (Foley or Fogarty, size 5–8 French) lubricated with lidocaine jelly can be inserted past the object, inflated with 2–3 mL of air, and then withdrawn., Alternatively, removal with a metal suction catheter up to 180 mmHg can also be attempted. For cooperative patients where the FB is easily visible, but all other options have failed, removal with cyanoacrylate glue may be attempted. A plastic swab is cut and the glue placed on the cut end, which is then pressed against the FB for 1 min while the glue dries. This technique risks application of the glue to the nasal mucosa itself, which may result in severe damage and inflammation. It should, therefore, be used with caution and only as a last line for visible FBs. Button batteries are found in certain electronic devices such as toys, hearing aids, and household appliances. If placed in the nose, strong electrical currents from the negative pole cause alkaline tissue necrosis of the nasal septum, risking perforation. Urgent removal is warranted. 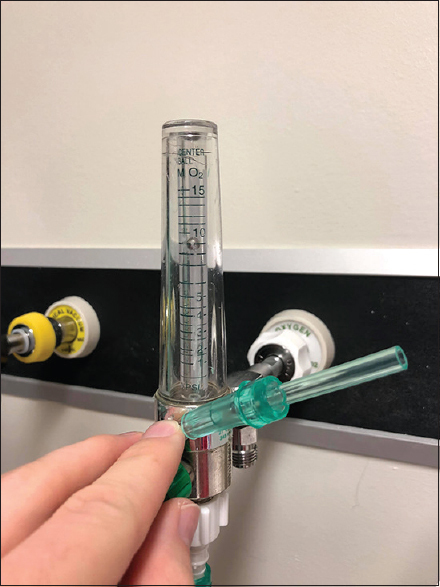 Importantly, topical anesthetic and/or vasoconstrictor drops should not be used., A right-angle hook or catheter may be used for removal as described earlier. The nasal cavity should be irrigated with copious amounts of normal saline following successful removal of the battery to ensure removal of any residual foreign material. Instruments with pointed and sharp grasping apparatuses such as cup forceps should be avoided as they risk perforating the battery casing. An otolaryngologist should be urgently consulted if removal is unsuccessful. Disc magnets are used as backings with certain jewellery. If they are placed in both nostrils, there is potential for them to attach to each other across the nasal septum, risking perforation. Removal may cause discomfort and bleeding, and so it is recommended to prepare the nasal surface with a lidocaine and vasoconstrictive mixture as described earlier. The removal of disc magnets can be achieved using mosquito forceps to pull one magnet apart from the other. If this is unsuccessful, a pocket magnet pickup clamped to a hemostat may be used to magnetically detach one of the disc magnets. It may be helpful to use one magnet on each disc magnet to pull them apart. Yeh and Roberson describe such a method whereby two cardiac pacemaker magnets were applied to separate micro polypus forceps and operated by separate physicians to pull the disc magnets apart. Intranasal FB removal can be safely achieved in the community emergency room or office setting with the right equipment and a cooperative patient. Posterior intranasal FBs, button batteries, and disc magnets may require advanced techniques and otolaryngology referral if the above-described techniques are not successful. Declaration of patient consent: The authors certify that they have obtained all appropriate patient consent forms. In the form the patient(s) has/have given his/her/their consent for his/her/their images and other clinical information to be reported in the journal. The patients understand that their names and initials will not be published and due efforts will be made to conceal their identity, but anonymity cannot be guaranteed. Financial support and sponsorship: Nil. Celenk F, Gokcen C, Celenk N, Baysal E, Durucu C, Kanlikama M, et al. Association between the self-insertion of nasal and aural foreign bodies and attention-deficit/hyperactivity disorder in children. Int J Pediatr Otorhinolaryngol 2013;77:1291-4. Figueiredo RR, Azevedo AA, Kós AO, Tomita S. Nasal foreign bodies: Description of types and complications in 420 cases. Braz J Otorhinolaryngol 2006;72:18-23. Ogunleye AO, Sogebi OA. Nasal foreign bodies in the African children. Afr J Med Med Sci 2004;33:225-8. Kalan A, Tariq M. Foreign bodies in the nasal cavities: A comprehensive review of the aetiology, diagnostic pointers, and therapeutic measures. Postgrad Med J 2000;76:484-7. François M, Hamrioui R, Narcy P. Nasal foreign bodies in children. Eur Arch Otorhinolaryngol 1998;255:132-4. Yeh B, Roberson JR. Nasal magnetic foreign body: A sticky topic. J Emerg Med 2012;43:319-21. Claudet I, Salanne S, Debuisson C, Maréchal C, Rekhroukh H, Grouteau E, et al. [Nasal foreign body in infants]. Arch Pediatr 2009;16:1245-51. Taylor C, Acheson J, Coats TJ. Nasal foreign bodies in children: Kissing it better. Emerg Med J 2010;27:712-3. Navitsky RC, Beamsley A, McLaughlin S. Nasal positive-pressure technique for nasal foreign body removal in children. Am J Emerg Med 2002;20:103-4. Starke L. Easy removal of nasal magnets. Pediatr Emerg Care 2005;21:598-9. Kadish HA, Corneli HM. Removal of nasal foreign bodies in the pediatric population. Am J Emerg Med 1997;15:54-6. Raskin BI. A simple pediatric restraint. Cutis 2000;66:335-6. Fox JR. Fogarty catheter removal of nasal foreign bodies. Ann Emerg Med 1980;9:37-8. Henry LN, Chamberlain JW. 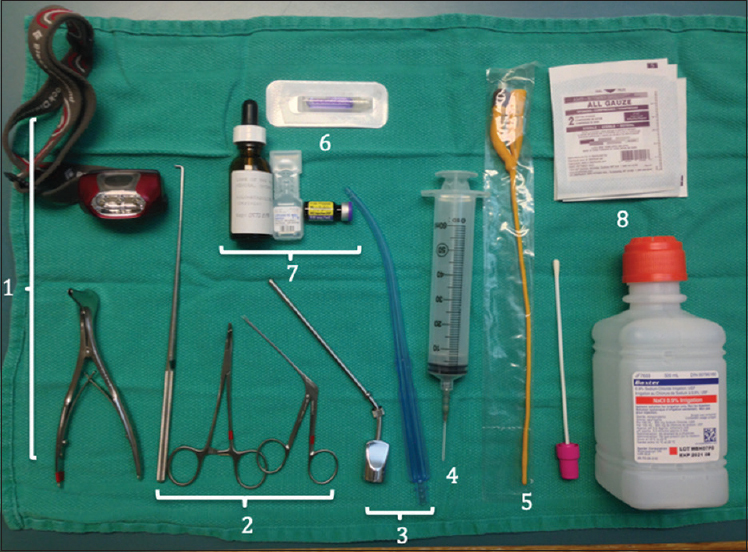 Removal of foreign bodies from esophagus and nose with the use of a foley catheter. Surgery 1972;71:918-21. D'Cruz O, Lakshman R. A solution for the foreign body in nose problem. Pediatrics 1988;81:174. Hanson RM, Stephens M. Cyanoacrylate-assisted foreign body removal from the ear and nose in children. J Paediatr Child Health 1994;30:77-8. Kavanagh KT, Litovitz T. Miniature battery foreign bodies in auditory and nasal cavities. JAMA 1986;255:1470-2. Dane S, Smally AJ, Peredy TR. A truly emergent problem: Button battery in the nose. Acad Emerg Med 2000;7:204-6.